"We're elated by Judge Daniels's decision�made from the bench�to reject the City's attempt to get Noel v. TLC dismissed. Our attorneys made it clear that the City's attempts to claim that federal and state law do not apply to its regulation of the taxi system are wrong." In his decision, Judge Daniels said he wanted to know if the TLC is taking steps that would result in "reasonable, meaningful access" for wheelchair users. He called for discovery in the case to move forward in anticipation of a conference with the plaintiffs, represented by Disabilities Rights Advocates, and the defendant�the City of New York--on August 10. Before oral arguments, plaintiffs and other supporters in the case held a news conference outside the United States Courthouse of the Southern District in downtown Manhattan, holding signs reading, "NYC & TLC: Obey the Law" and "Taxi Roulette�1 in 57 Chance" with a picture of a roulette wheel. This is a reference to the fact that there are only 232 wheelchair-accessible taxis out of 13,237 taxis in New York City. For more information, please contact Joseph G. Rappaport at 646-284-1078, 212-662-4449 or jgrappaport @ rocketmail.com. The picture above is from the video "Not Done Yet," which was produced by James Estrin and Valerie Lapinski. A group of aging folk singers slowly enters a church basement in Manhattan where they are to give a concert. Observing them maneuver to their places behind the microphones � some are blind, others are in wheelchairs, some are accompanied by family members, others by home health aides � it is clear that this concert is going to be a little out of the ordinary. Members of the audience, many of whom are also disabled, erupt in cheers and whistles as the Disabled In Action (D.I.A.) Singers launch into their anthem, "Two Good Legs." Yes, crippled in the heart. If you're crippled in the heart? Influenced by the songs of the civil rights movement of the 1950s and '60s, the D.I.A. Singers provided the soundtrack to their own struggle for equal rights and equal access over the last 35 years. And like their role models, they did more than sing songs. They also took to the barricades. 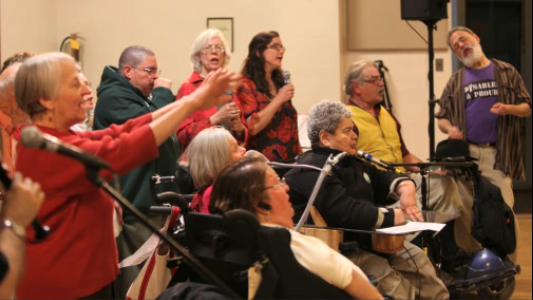 The group sang its testimony at hearings about public access before the board of the Metropolitan Transportation Authority. They also took over the M.T.A. executive offices with a sit-in. Until you've seen politicians and police captains trying to figure out how to remove dozens of people in wheelchairs, you haven't fully experienced the power of civil disobedience. 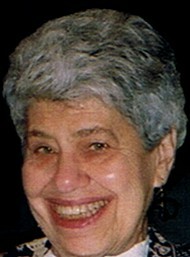 "Singing was part of the struggle," said Anne Emerman, who � with her husband, Sidney Emerman � helped found the group. "Our songs were political and they worked in tandem with our activities in the streets and the legislative halls." "It was persistent and directed work, but we had a heck of a lot of fun. And that was the key." Along with other activists around the country, the singers insisted on universal access to streets and buildings, to public transportation, to affordable housing and supportive services. Their struggle for equal opportunities reached a milestone 20 years ago this week when the Americans With Disabilities Act became law, prohibiting discrimination because of disability in the full and equal use of public accommodations. Founded in the late 1970s, the D.I.A. Singers performed in nursing homes, at rallies and for several years at the annual Clearwater Festival. They even issued two CDs. But as they have grown older, and the demonstrations fewer, they've performed less often. The concert in April was billed as a reunion. Though her comrades in wheelchairs are now mostly in their 60s and 70s, Ms. Emerman said they still have important battles to fight. "These massive government budget cuts are threatening many of our gains," said Ms. Emerman, who was director of the Mayor's Office for People with Disabilities under David N. Dinkins. "You always have to push government to comply with their own laws." Edith Prentiss was not fooled by a ramp sloping down toward the L platform at the Eighth Avenue subway stop. By now, Prentiss -- who has used an electric wheelchair since 1992 because of severe asthma -- is all too familiar with the unpredictabilities of the city's mass transit system that serve up everyday obstacles to disabled New Yorkers. Sure enough, just out of sight from the top of the ramp was a flight of stairs that Prentiss, 54, would find impossible to navigate. She was left to squeeze into an elevator packed with baby strollers and other straphangers, because the station at 14th Street and Eighth Avenue is one of 53 subway stations either partially or fully accessible to the disabled in a vast system that contains 468 stations and sees 4.8 million riders on an average weekday. According to an August report by Manhattan Borough President Scott Stringer, which examined outage and repair data over four years for elevators and escalators in Manhattan subway stations, the services available to disabled riders are often unreliable. The report found that the average elevator in Manhattan stations is out of service 10 days per year, and one elevator at the West 4th Street station was not in operation for 134 days in 2004. In addition, 78 percent of all elevators in Manhattan stations did not receive a mandated inspection each year between 2002 and 2005, the report said. New York City Transit, which falls under the auspices of the Metropolitan Transportation Authority, says that the borough president's report does not accurately reflect the extent of their vigilance. "We want to clarify that we do inspections quite regularly," said spokeswoman Deirdre Parker, who added that the elevators are checked out at least once every six months, undergo other tests at least once a year, and receive preventative maintenance about every two weeks. Parker also stressed that an elevator outage may not be caused by faulty machinery. "Sometimes we'll have problems with vandalism, and the elevator is out of service," she said. But the report's findings ring true for Prentiss, who says that, in addition to erratic elevators, wheelchair users also have to contend with sizable gaps between the platform and the train, narrow platforms that push them uncomfortably close to the edge and central poles that inhibit movement in the subway car. Prentiss, who practiced social work until 1993 and then served as an administrator for a rehabilitation practice until 1998, lives in Washington Heights and is first vice president of Disabled in Action, a group that advocates for disabled rights. In the course of one day -- in which Prentiss left her Washington Heights home, returned a microphone at B&H Photo Video on 34th Street and Ninth Avenue and went food shopping at Whole Foods Market and Trader Joe's in Union Square -- Prentiss encountered 12 elevators. On the A train platform at 34th Street, Prentiss demonstrated how her wheelchair can get stuck in the gap. Years of experience have taught her to rear up on her back wheels, gain momentum and plop her front wheels down on the other side of the gap. "I don't think many people have made the jump to subways," she said. "Your chair has to be stronger than an ox to use the subways." The MTA provides information about possible gap problems for disabled users on its Web site, and Parker said that three stations that have especially curved platforms -- the 1 platform at South Ferry, the 4/5/6 platform at Union Square and the shuttle platform at Times Square -- are equipped with gap-fillers, miniature walkways that connect the train and the platform. But all of those stations aren't fully accessible to wheelchair users -- for example, the Union Square station only has elevator service to the L, N and R subway lines. The gap is why Doris Seligman, 71, of Woodside, usually opts to take the bus, except in circumstances when either time constraints or the distance to her destination require a train ride. On a recent afternoon, Seligman had to scour half the length of a subway platform in Flushing in order to find a point at which she could safely roll onto the train. "You can't be spontaneous when you're disabled," said Seligman, who started using a wheelchair after a bout of polio left her paralyzed when she was 15. "You need to do a lot of planning. Even then, it might not work." New York City Transit says it runs a hotline that is updated four times a day, but Prentiss said the hotline's information about which elevators are functional is often inaccurate. And finding an alternate route to her destination that is accessible can add miles to any mass transit journey. "You have to know New York intimately," Prentiss said. "Because you never know where you'll end up going." Even when the elevators are working, she said, riding them is rarely a pleasant experience. Prentiss said she hears young children refer to the sometimes-smelly machines as "pee-pee elevators." At 34th Street and Eighth Avenue, other straphangers packed the elevator so Prentiss could not fit in. Parker said she admits that the system is not easy for wheelchair users, but she said New York City Transit is doing the best it can to make an old system accessible. "The subway system started in 1904, so they had no concept of allowing elevators in certain places or that people in wheelchairs would be using it," she said. "To try to modernize a system that's 100 years old is very difficult." Nevertheless, Prentiss continues to ride the subway and advocate for change. For Seligman, however, those inconveniences are enough to keep her off the subway all but one or two days a month. "Because there aren't enough stops, the elevators are unreliable, the gaps are formidable in many instances, it's not a viable option," Seligman said. "Would I like to be like everyone else and ride the subway? Of course." NEW YORK, NY May 16, 2006 � The taxi industry is up in arms about proposed legislation that would require half of the 308 taxi medallions sold next month be sat aside for wheelchair accessible cabs. REPORTER: The Taxi and Limousine Commissioner, Matthew Daus testified before the Council that his agency needs more time to find a more reliable model to put on the road and the council isn't giving them enough time before the auction. But Jean Ryan of Disabled in Action says the excuses have gone on too long. RYAN: There is always going to be some reason why we should not go forward with accesibilty if we waited for him to be ready, for the TLC to be ready we would never get there. REPORTER: Only 29 of New York's nearly 13,000 yellow cabs are accessible. NEW YORK, NY May 24, 2006 � There will be more environmentally friendly and wheelchair accessible taxis on the city streets in the coming months. REPORTER: Mayor Bloomberg and the City Council have reached an agreement to increase the number of alternative fuel taxis, to 273 from 19 during the cab medallion auction next month. But disabled advocates like Jean Ryan with the Taxis For All campaign say the increase won't matter that much, since there are still too few to find to hail from the street. RYAN: Well I'm really good at hailing a cab. I can go to the curb and say TAXI! just as good as anyone else but I can't get into a cab with my wheelchair because it weighs like 300 pounds and it doesn't fold up and go into the trunk. REPORTER: Ryan says the proposed increase of of 231 is still a better number than the 27 on the road now. But she'll still work toward legislation that will mandate that all taxis on the road will be designed to transport anyone that needs a ride.